I made a similar version of this for a friend that is recuperating from surgery…I didn’t have clams just shrimp, but no matter it looked fabulous and ready for the quick a 15-minute roast in the oven before serving time. No finished pictures for that, but I plan on making that for the kids when they come back. To spice things up Bittman adds sliced links of andouille sausage, but I think any favorite sausage would work nicely. The process is simple and it would be fun to roast everything in those little 6.5 inch skillets for individual servings for beachless clambakes rain or shine. Hey and maybe next time I’ll toss in a few shrimp when the clams go in or at the very least that last few minutes of roasting time. 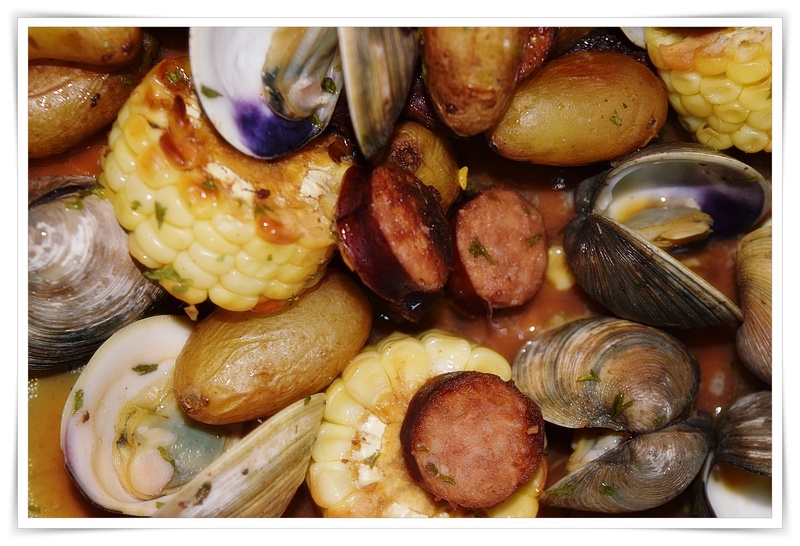 Look for additional minimalist clam recipes “The Big Dig” 12 clam recipes. Toss the corn, potatoes and sausage with olive oil, sprinkle several pinches Phillips seafood seasoning over and toss before roasting for 20 minutes in a preheated 400º oven stir often. Add 1/2-3/4 cup of beer, toss in clams and roast until the clams open. At this point if you might want to add a little butter and lemon as I did, toss again and garnish with a bit more seasoning as well as a little parsley and chopped chives parsley. Next Next post: What’s in Your Lo Mein Bowl?